Today’s post is sponsored by Land O’Lakes! I’m super excited to be using their new European Style Super Premium Butter in this recipe because, um, Tomato Butter Sauce? Yeah. And may I introduce you to what may be my new favorite way to eat chicken? It’s that beauty right up there, the one coated in the buttery garden-fresh tomato sauce featuring a few leaves of summertime basil and the aroma of freshly minced garlic. Yes, THAT is how I eat chicken. To be honest, I always feel a little hypocritical posting chicken recipes, because you already know how I really feel – a lot of the time I’m only so-so on this very regular white meat which is supposedly everyone’s favorite thing ever. But I guess that means that when I actually do post chicken recipes, you kindred chicken-meh spirits out there can join with me in knowing that there are at least a few good ways to make chicken that do indeed exist in the universe. Where my kindred chicken-meh spirits at? On the flip side of kindred spirits, this summer I *think* I might have officially joined the ranks of People Who Garden by no kindred association whatsoever – more by sheer determination and a lot of luck. And my entrance into the club really depends on if you can count plants that were purchased from a grocery store and/or plants that have shriveled and completely died since being in your care. It also depends on if your definition of Garden has a quantity cut off, because we’re working with about (count em) 1-2-3-4-5 single plants this summer. Okay, the tomatoes in those last pictures are actually not from my garden, but they ARE from my neighbor’s garden and they ARE the ones I used for this recipe. My own Roma babies are still, well, honestly, I just can’t bring myself to pick them yet. Newbie problems. If you are the neighborhood gardener who leaves drop-offs of perfectly garden-ripe produce on your neighbors doorsteps, I want to talk to you about moving into my hood. We live in a great neighborhood with lots of charming, adorab– fine, I’ll stop. You don’t have to move here. But this is truly how I received my tomatoes last week – the neighborly doorstep drop-off – and those tomatoes made me this dinner that made me like chicken for one night. That is some big time neighborly love right there. That is also some big time butter-ly love. Tomatoes. Olive oil. Garlic, basil, and butter. 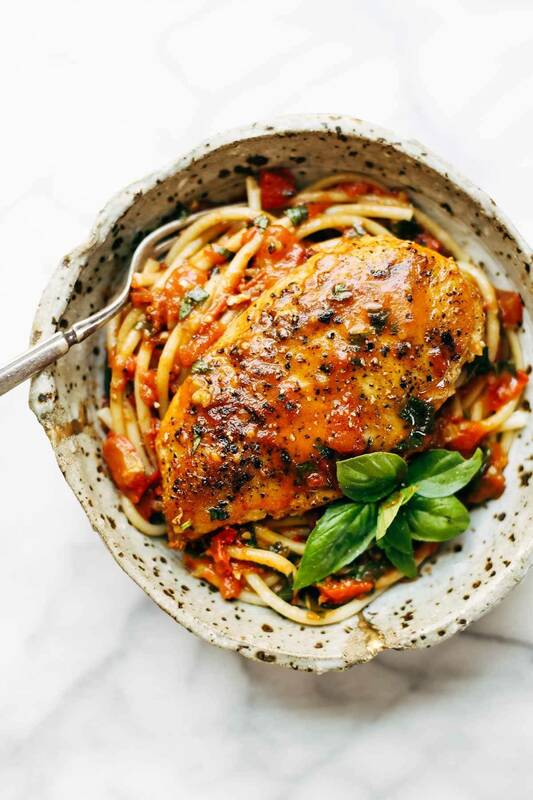 Hallelujah and glory be, this tomato-butter-garlic basil chicken combination was so utterly simple and perfect. The LAND O LAKES® European Style Super Premium Butter, as we talked about before, is just plain everything. The ingredient combination here is so simple that you must must must make sure every ingredient is high quality to the point of CAN’T NOT HAVE IT. 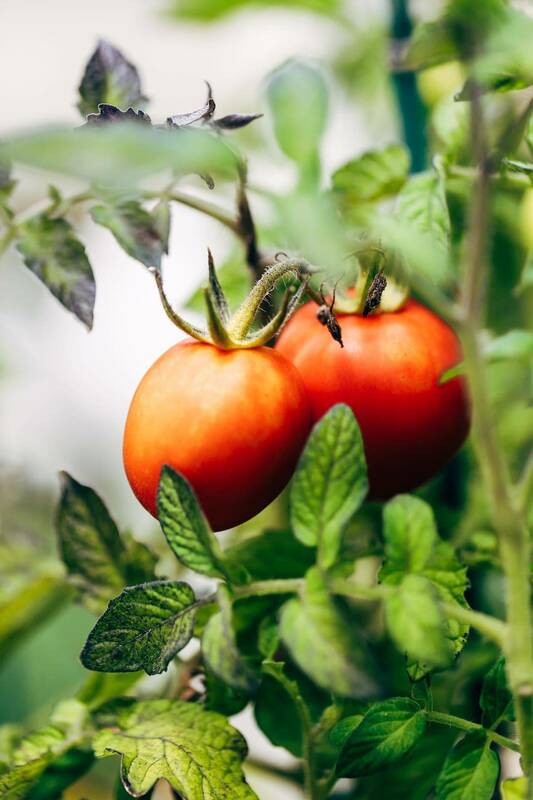 The tomatoes, the basil, the garlic – they must shine, and using a really high quality butter (made from sweet cream and churned for a higher percentage of fat) is the way to do it. And if you’re into butter and you’re into Instagram, I have the perfect thing for you: the Land O Lakes Instagram account which showcases all the amazing ways to use the golden child of all the butters. I am really just getting impatient for you to experience this end of summer perfection, so please experience it a-sap. I don’t mean to limit this recipe to end-of-summer months only, but. But but but. It’s going to be the best when you use the extra-ripe tomatoes that your neighbor dropped off on your doorstep or the explosion of end-of-summer farmers market basil and don’t panic but IT’S ALREADY THE END OF SUMMER. Thankfully tomatoes are good for a few more months yet, and your basil plants are probably all reaching the end of the line so you’re looking for ways to use up all that fresh basil (please tell me it’s not just me), and this is how you’re going to find yourself, in September, loving September, but savoring the heck out of these last few bites of summer. You can see the picture to see how much basil I used. I pulled all those leaves off, ribbon-ed them, and added them in! It was probably about one cup, loosely packed, but go by taste. If you’re not huge on basil, start with less. Lindsay these are the most stunning tomatoes I have ever seen!!! And your photography makes me drool & dream! Wish I was your neighbour and this is like heaven in a bowl! They are beautiful tomatoes Lindsay….I was tempted to put that in all caps but held myself back. And thank you for posting a chicken recipe…..honestly, we eat chicken almost every single night because that’s what my kids like. And I’m so boring that I can never think of how to prepare it. So like the electric slide (can you tell I was at a wedding this weekend!) you have spiced up my life. totally agree with this one. your presentation makes so much difference. Can I leave out the basil. I don’t like it or any herbs to be honest. I’d rather have it on mashed potatoes. What is written after the amount of butter. Do you think you can give me the amount in grams, or even ounces if you have no choice. I have no idea what a 1/4 or 1/2 a cup of butter is. 1/2 cup of butter is one stick or 113 grams. Hope that helps! My daughter is also not a huge fan of basil so I had two servings one with and the other without. She just loved it! We don’t always get Roma tomatoes here in NZ; instead I used truss tomatoes and this was yum! The dullness of colour didn’t do any injustice to the deliciousness of the dish! Thank you! That one was my 100mm lens! I have made a similar dish for years. My gran taught me when I was 13. She would bread the chicken. However, when I was in my 20’s I stopped doing that. She and I use a little lemon for briteness. Also, we used bone in chicken and cut off the bone. And a touch of pasta water if needed. This is a very good recipe. I think. 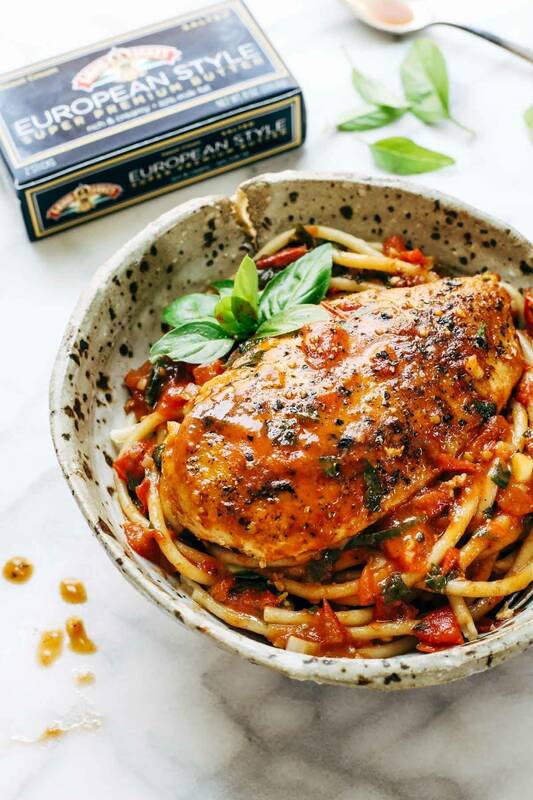 Tomato butter sauce with basil chicken goodness? You mean that’s a thing and I can shovel it into my face for dinner tonight? And by shovel, I really just mean face plant…because that is what this deliciousness calls for! And those tomatoes are GORG! I am jealous of your gardening ways, but congrats!! Pinned! Thank you Taylor! 🙂 I’m just a little proud of it. The sauce sounds amazing! We didn’t plant a garden this year but we have definitely taken full advantage of my family members gardens haha. I will have to try this out with some of those tomatoes. Hope you like it Ashleigh! Yum! This sounds delicious, and the pictures are perfection! I’m going to have to make this the second the weather cools up! I love looking at your pictures. They always get me excited to try out the recipes. Thank you Ann! Appreciate that! Thank you very much. Iy helpa tremendously. I am very meh towards plain chicken breast. Rotisserie whole chicken? Yes please. Chicken thighs? OMG give me more. But plain white meat chicken? Ugh if I have to. That being said, sometimes I want a simple meal of chicken breast, sauce, and a side for convenience sake. But I am absolutely not OK with that meaning I’m sitting down to bland, flavorless, dry chicken. It needs to be saucy. It needs to be juicy. It needs to be full of flavor. This recipe really fits all of those requirements and everything comes together so quickly. A perfect weeknight meal. 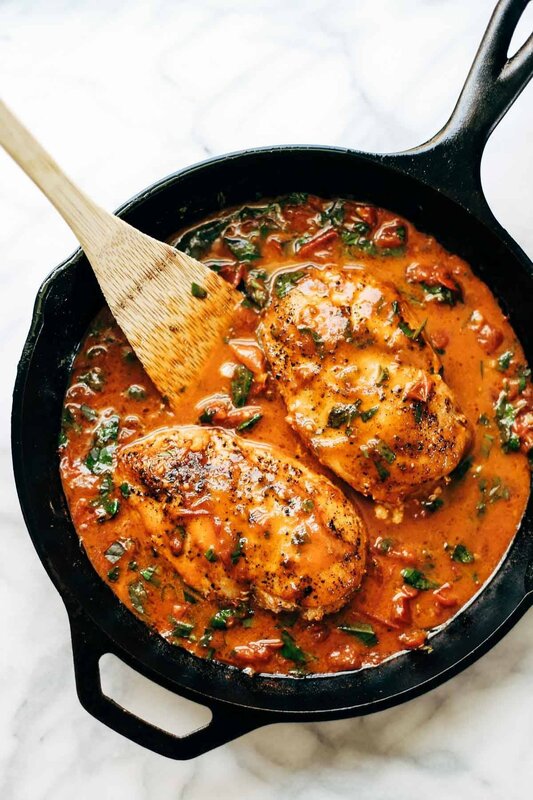 Oh man – tomato butter sauce sounds amazing and that chicken – forget about it! That butter! That chicken! That bowl! Drooling here, love this dish and can’t wait to make it! Psst…looks like someone has a new favorite bowl! This looks amazing btw! Pinned. Lindsay, that sauce!! This recipe looks like it’s gonna be a regular around our house! Thanks for sharing! Thanks Mary Ann! Hope you like it! The shine in these photos is golden! If we measure gardeners, especially new ones by their success or failure, no one would be a gardener. hahahaha I love you for that. Thank you Laura! 🙂 Appreciate that! Congrats on the garden success. You are a more determined person than I am! Um yes, I am making this for dinner right now!!! Minus the chicken though. Woo woo! Lindsay, if you want to understand why chicken is so ‘meh’, read the book, The Dorito Effect. When you get through with that you’ll understand. I can tell you that over my lifetime the flavor of chicken has changed greatly. I made something with thighs last week, which I always disliked because the flavor was so strong, and now I’d never know it was thighs had I not bought and prepared them. Basically they have no flavor any more. Welcome to the world of gardening. I’m sure you’ll get better at it. I started at a very young age, and have no idea whether or not I succeeded at the endeavor the first few years. Even for those of us who have been doing it for a lifetime, it can be frustrating. I’ve never been the greatest vegetable gardener. But it’s fun seeing what you can do. I’m looking forward to trying this chicken recipe at some time in the foreseeable future. Interesting! I will check out that book. Thanks for the comment Susan! I am not the meh-chicken person in our house. That would be the Mister but I am always trying something to tempt him to the other side. This looks deliciously tempting! He was saying I need to smoke a chicken so he could have some Alfredo. I think we may try this instead. What do you think? Yes! Definitely Yes! Although I love Alfredo too. 🙂 Enjoy Peggy! Where can I get that bowl? Hi, Nailah! Lindsay’s father in law made the bowl for her. This is what chicken is supposed to look like! DREAMY. I can’t dig into this pretty dish! Delish! I figured that if you have shared a meal with chicken in it on here, then it must be good! I love the way that sauce is sticking to the noodles – it’s gotta be from the butta! The combo of butter and olive oil is just mmmmmm perfect.